Christianity is not only a global but also an intercultural phenomenon. The diversity of world Christianity is evident not merely outside our borders but even within our own neighborhoods. Over the past half century theologians and missiologists have addressed this reality by developing local and contextual theologies and by exploring issues like contextualization, inculturation, and translation. In recent years these various trajectories have coalesced into a new field called intercultural theology. Bringing together missiology, religious studies, social science research, and Christian theology, the field of intercultural theology is a fresh attempt to rethink the discipline of theology in light of the diversity and pluriformity of Christianity today. Henning Wrogemann, one of the leading missiologists and scholars of religion in Europe, has written the most comprehensive textbook on the subject of Christianity and culture today. In three volumes his Intercultural Theology provides an exhaustive account of the history, theory, and practice of Christian mission. Volume one introduces the concepts of culture and context, volume two surveys theologies of mission both past and present, and volume three explores theologies of religion and interreligious relationships. 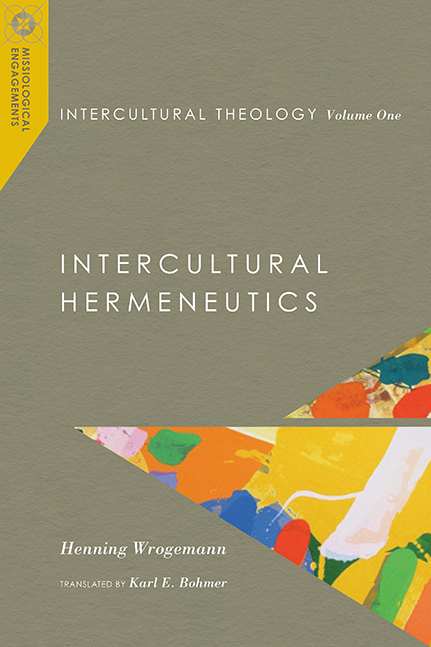 In this first volume on intercultural hermeneutics, Wrogemann introduces the term „intercultural theology“ and investigates what it means to understand another cultural context. In addition to surveying different hermeneutical theories and concepts of culture, he assesses how intercultural understanding has taken place throughout the history of Christian mission. Wrogemann also provides an extensive discussion of contextual theologies with a special focus on African theologies. Intercultural Theology is an indispensable resource for all people―especially students, pastors, and scholars―that explores the defining issues of Christian identity and practice in the context of an increasingly intercultural and interreligious world.